When last we spoke about Morrissey, as we often seem to do these days, the singer had just finished off the Ramones’ “Judy is a Punk,” exited stage left, departed the Eccles Theater and ascended to where ever he might go when he steps out of the spotlight. If he ever steps out of the spotlight. If he wanted to, who would let him? Such is the burden of being Morrissey. It’s not nearly as cold as you might expect for a November night as I make my way into Kingsbury Hall. There is no opening act, a tradition that Morrissey has done away with for the time being (unless he’s playing the Hollywood Bowl, where Billy Idol warms the audience). So we’re treated to a collection of videos from Morrissey’s favorite music influences. I’ve seen the film before, but the eclectic nature of the songs entertains me nonetheless. When Morrissey, band in tow, takes the stage, the crowd erupts. Most remain standing for the remainder of the night. There are many celebrities who inspire a sense of frantic devotion, but there’s something different about a Morrissey crowd. To start the show, we’re treated to “You’ll Be Gone,” an Elvis Presley cover that works rather well. 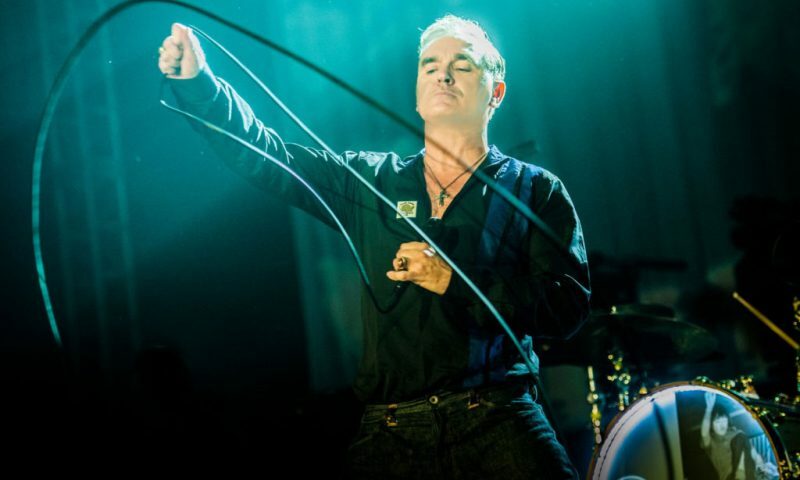 But it is the second song, “I Started Something I Couldn’t Finish,” the first of three tracks culled from Morrissey’s time spent in The Smiths, that really sends the audience into a frenzy. “I Wish You Lonely,” a track pulled from his latest release, Low in High School, leads into “When I Last Spoke to Carol” from 2009’s Years of Refusal. From there, the song selection wanders into familiarity as “Ganglord,” The Bullfighter Dies” and “Speedway,” a trio of songs that have been featured in the setlist for years, are played. 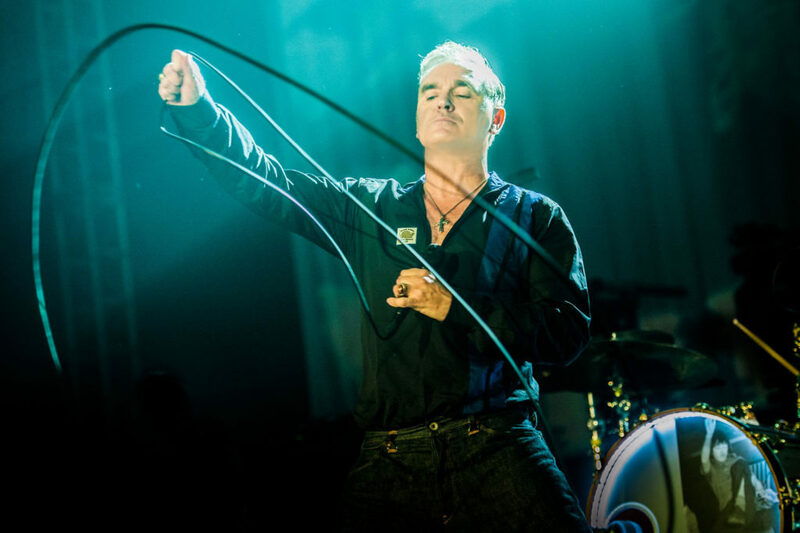 To this point, Morrissey has’t been nearly as chatty as he was a year ago, but before the new song “Jacky’s Only Happy When She’s Up on the Stage” is played, he reminds the audience that he has a new album that was released only the day before. He then laments that he called three local music shops and that they all hung up on him when he asked if they had “the new Morrissey” record. “Kiss Me a Lot” serves as a bridge leading into two more new songs, “Spent the Day in Bed” and “When You Open Your Legs.” The audience welcomes the new material, and while I’m certainly more familiar with the older songs, the chance to hear new material for the first time keeps the night from becoming too predictable. With “Istanbul,” one of my favorite tracks from World Peace is None of Your Business, the band launches into an impressive string of five songs that prove to be the night’s highlight. The Smiths’ “How Soon is Now” leads into “I’m Throwing My Arms Around Paris,” “World Peace is None of Your Business” and “Home is a Question Mark.” The last song, another new track, is dedicated to David Cassidy. It is here where the show stalls for the first time as a cover of The Pretenders’ “Back on the Chain Gang” feels a bit out of place. Rather than stalking the stage, Morrissey stands fairly still at the center of the stage, appearing somewhat disinterested. The encore consist of “Suedehead” and “Shoplifters of the World Unite.” During “Suedehead,” numerous fans, despite the massive mountain of a man who stood just off stage, made their way to the stage, causing Morrissey to alter the “It was a good lay” lyric to “It could be civilized.” “Shoplifters of the World” gets the Donald Trump lyric, and by the time it ends, Morrissey is shirtless as he exits the stage. We didn’t get “(I Never Promise You a) Rose Garden,” but I don’t think the show suffered from its exclusion. All in all it was another strong performance from Morrissey and his band. I would have liked a little more variety from the setlist, but that’s only a minor complaint. I just wish they’d stop ignoring the existence of Your Arsenal.